The people who run Australian media outlets love stories that can be framed as “drivers vs cyclists”, and a real beauty has just dropped in their laps. It’s an online petition calling for double-file cycling to be outlawed. This is currently legal, despite many people believing otherwise. One of the better treatments of the issue was from The Project. Click to watch their segment. The cycling social media world is up in arms and some are even trying to shut the petition down on the grounds that it’s “endangering lives” or even that it’s hate speech. 0.5 m When riding a bike you need a buffer from edge of road/left lane in case of debris, potholes, or just to give room for a slight wobble. 1.9 m Width of 2018 Holden Commodore. Some cars are narrower, but then buses and trucks are much wider. And guess what? The standard urban lane width in Australia is 3.5 metres. It’s often narrower, particularly in inner-Sydney where I live, and particularly on main arterials where widths of 2.7 – 2.9 metres are common. The upshot is that drivers need to change lanes to overtake people on bikes, whether single- or double-file. 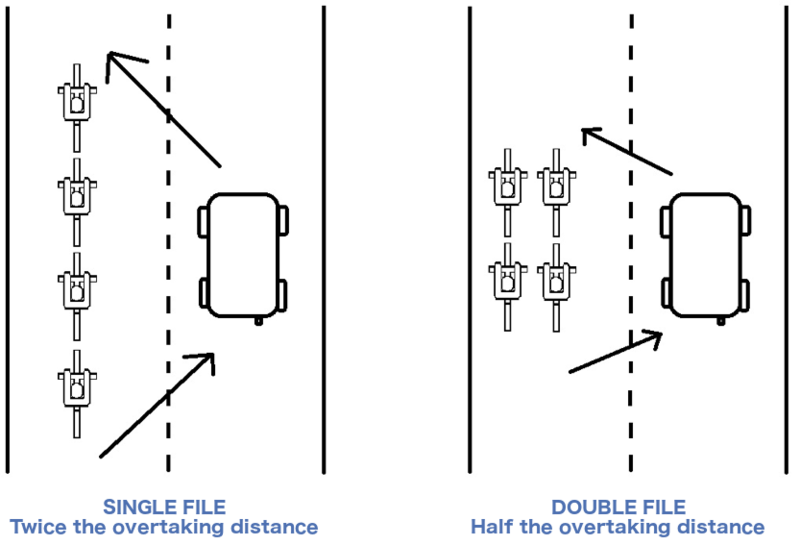 But single-file riders are roughly double the overtaking distance of double-file riders. Be careful what you wish for DFROC. Like so much of the “popular” reaction to cycling issues in Australia, this petition isn’t based on practicality. It simply an attack by one group against another they perceive to be less powerful than them. The petition appears to originate from a Facebook page called “Drivers for Registration of Cyclists”, which until about a year ago was a satire page filled with cleverly faked news articles showing moronic motorists becoming bewildered as they were faced with the negative implications of their own demand for registering cyclists. 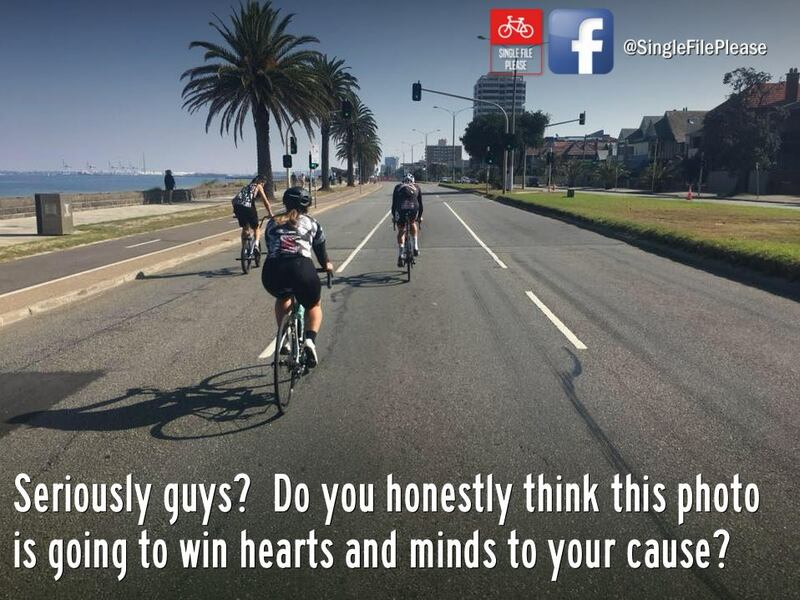 And then about a year ago the page abruptly did a 180, and became filled with cleverly faked photos showing cyclists doing supposedly “wrong things”, mixed with strident demands for “single file please”. It was hard to understand. Were we all being subjected to an elaborate, but obscure experiment in manipulating our assumptions and our emotions? The Photoshop fakery style before the switch was identical to that after the switch, suggesting that if it wasn’t the same author it was somebody who had closely studied their style and had the skills to copy it exactly. The “new” DFROC showing their competent Photoshop skills, cutting and pasting riders from one part of the road into another. It was weird. After a few weeks of it I unsubscribed, dumping it in the “unsolved mysteries” department in my mind. The petition has brought the mystery of “Drivers for Registration of Cyclists” (or DFROC as they’re known by cyclists) into the limelight. The general consensus is that it is the work of an Australian sports cyclist named Ivan Vetsich, but some believe it is connected to a man named Ivan who lives in Ireland. Are there two Ivans? Did Australian Ivan move to Ireland and become Irish Ivan? If he did, why is he still banging on about Australian cyclists and trying to get the Australian law changed? Cycling Tips has gone deep into the rabbit hole with this piece on DFROC: Finding Mr X; The story of an anti-cycling hate page (and the cyclist behind it).